The cold, inky vastness of space. It’s captured our imagination since Le Voyage dans la lune, if not before. The exploration of it was captured by Star Trek, and the realization of it by the Apollo Program. EVE Online is the game that’ll put you there. Doesn’t describing it as an unsharded, persistent space simulator with a player-driven economy and real-time combat strip away some of the romance? Space is cold, empty, very big and often hostile, and EVE captures this perfectly. Intimidating for many because of its great depth, EVE has the sole distinction among MMOs of being a shardless world – everyone plays on the same server, with concurrency typically well into the tens of thousands, and the game universe is big enough to accommodate them all – big enough, in fact, to manage quite a lot of cold, inky vastness as well. The game’s other unique features are sophisticated manufacturing, research and market systems resulting in an economy that’s almost entirely driven by player activity, and a character advancement system wherein improvement happens in real time, without regard to what in-game activities you’re actually doing – and keeps happening even when you’re offline. It’s the player-driven universe that’s EVE’s great virtue, though. To a huge extent, EVE is about PvP, but also embraces the idea that PvP does not always have to mean shooting at people. You can conduct PvP on the market or in the propaganda war, and these can have a significant effect on your military effort – or even replace it. And PvP is rewarding not just for the glory of blowing stuff up, but for the cash and loot you can get from wrecks. EVE’s PvP can be an end in itself, but it can also be something you do to accomplish something else. EVE helps you create a character, gives you a platform for play, and then turns you loose on it. After entering the game you can pretty much do whatever you want, and the dilemma that most new players will face very quickly is figuring out exactly what to do. The most common early-game activities are mining and mission running, although some players will elect to trade or manufacture instead. Once established you can do all kinds of other things: research new technology, build space stations, forge powerful, galaxy-affecting alliances, study the forgotten relics of ancient civilizations, explore the strange and unique corners of the galaxy, set bounties on players who annoy you, turn yourself into a mining or manufacturing powerhouse or a market kingpin, set up interstellar investment funds, run a tramp trading company. Hell, you can even roleplay – there are corps for that, along with enough background material to impress even the most jaded lore junkie. 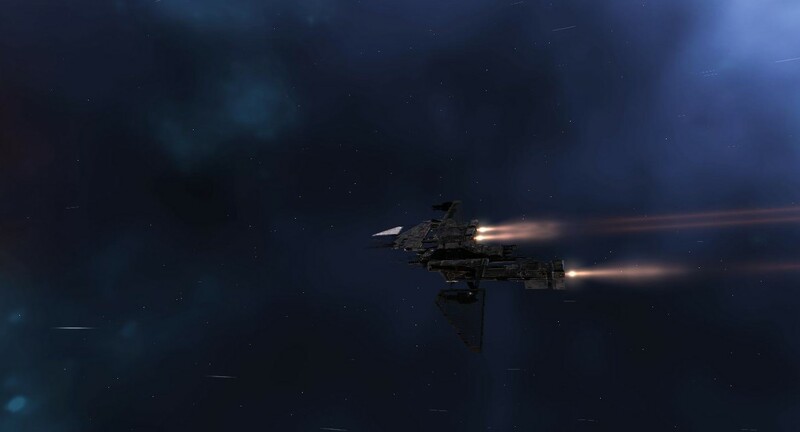 One drawback that EVE is well known for is that you can’t leave your ship – your character is and will remain a little still portrait in the corner of your screen, with your vessel doing all the action. This is set to change around the end of 2008, with the introduction of what’s being called Ambulation, the ability to get off the ship and walk around on space stations. Exactly what non-shipboard activities will be available isn’t yet clear, but meeting rooms and minigames are probably on the list. This touches on another virtue of EVE – the ongoing commitment by the development team to improve the game not just by adding more content, but by introducing entirely new aspects of play over time. Contracts, player-owned stations, research, exploration and now factional warfare all represent very significant shifts in gameplay, and all of them were introduced, or at least realized, well after the game was launched. This is very significant; certain other development teams regard their core gameplay as basically sacrosanct and unchangeable, and any new elements they add turn out not to alter overall gameplay very much, or add anything substantively new to the play experience. EVE does this, and does it regularly. Ambulation will only be an especially obvious example of a totally new dimension added as part of the ongoing improvement process. Since you are confined to your ship for the time being, though, luckily EVE has a lot of different ship models available, ranging in size from tiny shuttles to vast behemoths carrying Death Star-class weaponry. 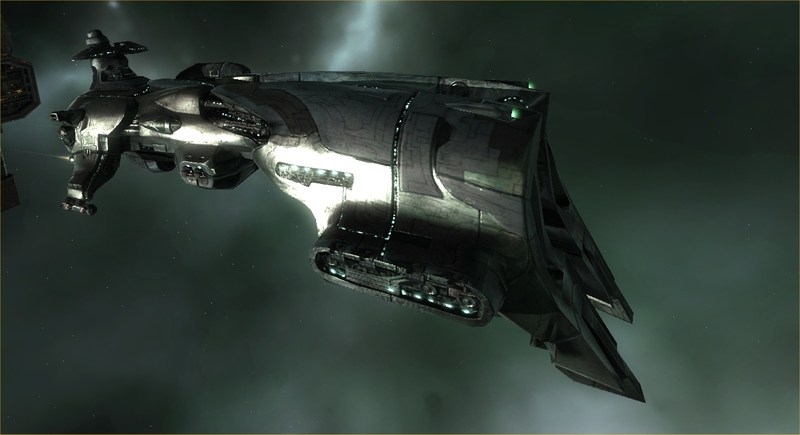 There are mining and fighting ships of all sizes, but also stealth and ECM ships, transports, interdictors, missile boats, scouts… dozens and dozens of ship types in all, and each race has its own set of design doctrines that make its ships better at certain ways of doing things and worse at others. How this stays balanced is somewhat beyond me, but it somehow manages to. How you fit out your ship is up to you; there are thousands of different modules available (almost all of them manufactured by players,) priced anywhere from tens of credits to billions. The number of possible combinations on any given ship is probably incalculable. As your skill base broadens and deepens over time, you gain the ability to fly different kinds of ships and use a wider variety of modules, some of them very specialized. To fly the most demanding ships can take years of training time, but when you jack into that Titan, chances are good that the entire galaxy will hear about it. All this depth comes at a price; EVE is famously user-unfriendly. You can certainly succeed in it as a new player, even without connecting with an established corp or availing yourself of some of the many excellent resources the community has put together. But it’s hard sometimes. The character advancement system replaces the XP grind of a traditional MMO with a money grind, as you mine or play the market or run repetitive missions to finance the activities you really want to do. But you can get around that in a corp which has members who like that sort of thing, allowing those who prefer to fight to do so without having to go back to 1.0 to grind up more cash. Compounding EVE’s oft-overstated difficulty is the fact that it’s so completely different on almost every level from anything else on the market. Yes, you can run missions, and these are similar to quests in other MMOs, but that’s only a fraction of the game. There are no classes, no levels, no bosses, no avatars, no aggro, no pets, no text dumps telling you where to go next… someone coming in from a few years of WoW and nothing else has every right to be caught flatfooted. EVE is a game that rewards initiative and careful planning. It rewards analyzing the numbers and really understanding the game’s dynamics on both the social and mechanical levels. It requires you to set goals for yourself and create your own direction if you’re going to get the most out of it. EVE won’t spoon-feed you anything, and neither will its community. They’ll give you tools and pointers, some of them very detailed, but it’ll be up to you to succeed and thrive or fail and unsubscribe. My advice for players new to EVE is to realize that the game is complex, but that the complexity makes it rewarding in a way that simpler games can’t be. Do your homework; read up on the kinds of stuff you want to do and how they work. Then check out all the other things you can do, and maybe you’ll find one or more of them unexpectedly interesting. And find yourself a great corporation, or failing that, create one. 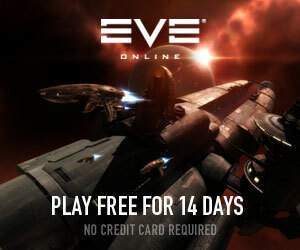 This entry was posted in Commentary, Series: The Best MMOs on the Market and tagged EVE Online, The Best MMOs on the Market. Bookmark the permalink. Litle did we all know that Ambulation has secretly been in EVE since late last year! Only those who know the double-secret code have participated in it, and they’ve all been sworn to secrecy! Thanks for the pointer. It’s fixed now. You convinced me with your articles to go back to vanguard and now you make me want to go back to eve. I’ve cleaned up and slightly expanded the article – I should have polished it a little more before posting it, as Tipa’s helpful comment indicates. But that’s okay, because I intend this series of articles to be living documents, updated with fresh data as it develops. Stay tuned for the next one, probably next week. Now how the hell did I miss this! OK, so I added it to my speedlinking post and submitted it to Digg. Hopefully that’ll be enough for missing the article in the first place.